Our house is adrift in apricot heaven. 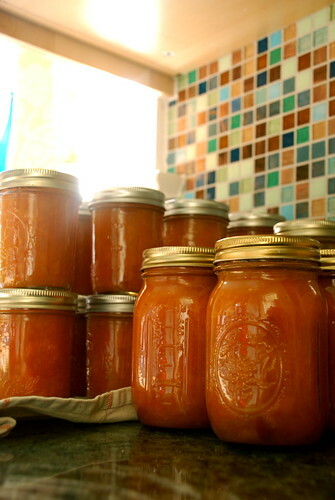 Over the past couple of days we (me, Jared, and my mom) did a ton of canning and made scrumptious apricot jam. I hadn't canned before in the real, for sure they're gonna make it, kind of method which involves a lot of boiling water. But this time I decided to go for it, and to be honest, it's not that hard. 3/4 fill a huge pot (think mine is maybe 16 quart size) with very ripe halved & pitted apricots. Add to the pot 7-8 cups of sugar (how sweet do you like things? Add a little more sugar if you're a sweet tooth, or a little less to have more of that yummy apricot tang). Then you need citrus - lemon juice is recommended, but I have oranges. I squeeze in the juice of 6 oranges, give it a whirl and it's good to go. Bring to a low boil then keep cooking on medium low heat. Stirring. A lot. I think I probably cook and the stir the jam for 25-30 minutes. I like it to get to the point where the apricot halves are starting to fall apart and the jam is getting thick and boiled down a bit. While the jam cooks, boil your jars and lids in a big pot. Boil for about 10 minutes then turn off the heat and let them sit in the hot water while you prepare to fill them. Fill your jars with the hot jam...fill to about a 1/4" below the rim of the jar. It's exceptionally handy to use a wide mouth funnel (I'm serious - you need one of these!). We also really like the specific tongs used to maneuver the jars in and out of the boiling water pot. Put the now sterilized jar lids in place then screw on the tops. Then they're back in the water to boil for 5-10 minutes. Lots and lots of apricot jam...can you believe that color?? And with all that canning, and more than one apricot crisp baked (and eaten), we still have some left. I'm thinking mostly straight up munching, but maybe an apricot pie would be lovely too - paired with peach maybe? Yum.